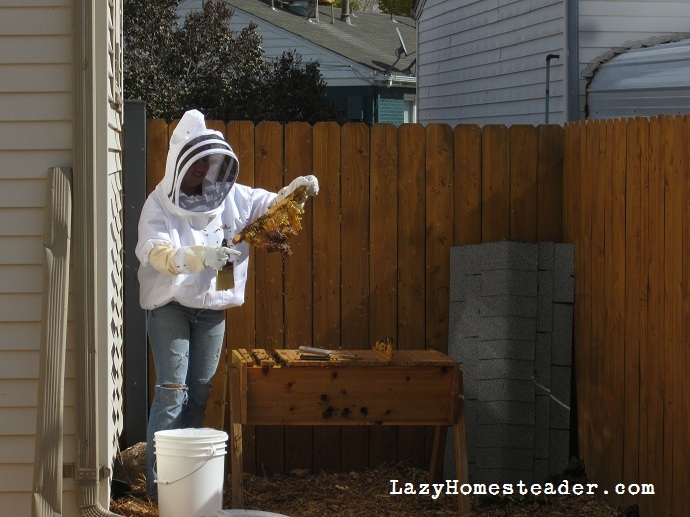 A note before reading this: we are total beginners at beekeeping. We got into this like everything else we do around here; we jumped in with both feet and are learning as we go. We have a mentor-friend who knows more about bees than us (he caught this swarm for us), but he keeps a Langstroth hive, which is different from keeping top bar hives. So our method is based on what we’ve read about. Smart people would take a class or something. A few weeks ago, we decided to open up the beehive and check on the ladies before the winter really kicked in here. We were happy to see that they had built comb throughout the entire hive and, by the looks of things, will have plenty of honey to get them through the winter. I really didn’t have much time to devote to the bees this summer, so we were unsurprised (but disappointed) to learn that they built all that comb diagonally across the bars. With top bar hives, the idea is that the bees will build straight comb, one on each bar, and you will be able to pull up one bar at a time. When I checked them this spring, we saw the cross-combing then, but it was minor and I just didn’t have time to get in there and correct it. The first couple of bars we lifted broke some combs, which is not unusual. 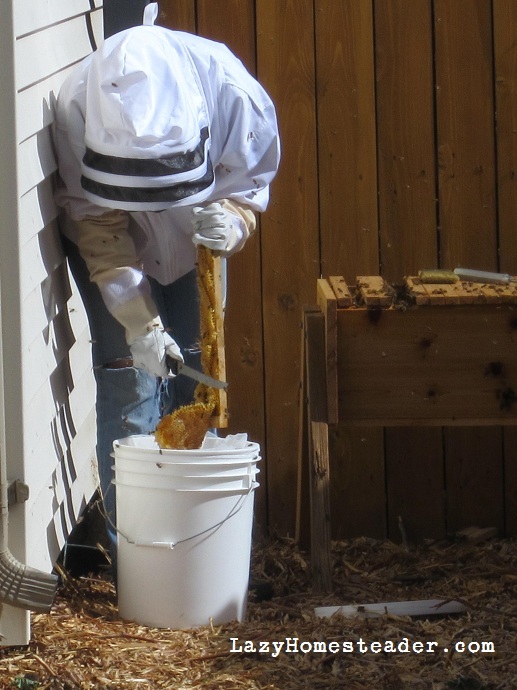 After you get the first bar out, typically you can use a top-bar-hive-tool to cut along the sides of the hive, and hopefully not break any more comb. However, with cross-comb, all the bars get joined together by the beeswax, making it much harder not to break comb. I decided to go ahead and harvest the honey from the first bars I pulled. I was really excited to see how full the hive was. In the picture below, I am holding two bars together and there are five or six separate combs diagonally across the bar. The cross combing is no longer minor, and we will have a lot of work ahead of us this summer to get the bees back on the straight and narrow, so to speak. Lesson learned. To harvest honey comb from a top bar hive, you have to cut the comb off. 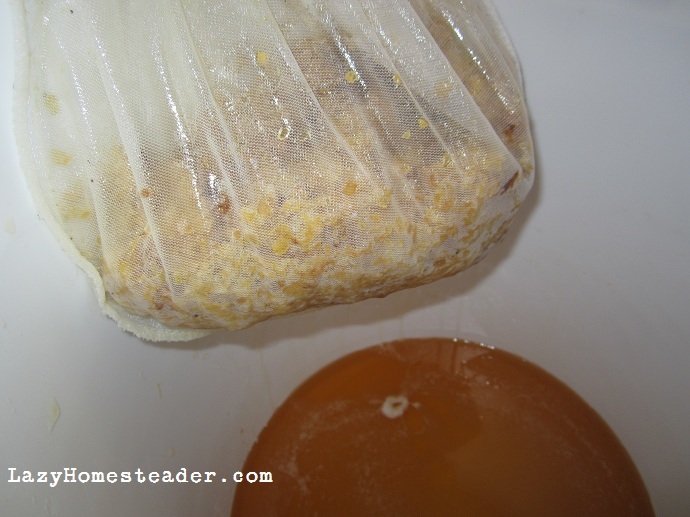 This honey is going into a food-grade bucket lined with a mesh bag, both of which we bought at our local apiary supply store for this purpose. Side Note: Notice the holes in my jeans? Yeah, well the bees did too. Smart people would not wear holey jeans to harvest honey. Smart people (Rick) may have even told me this before I did it. But I didn’t listen. Normally our bees are fairly mellow. Yeah, not so much when you are stealing their stash. Also – like a dumb-dumb, I didn’t think about the bucket being knee-height. I only got about eight stings thanks to Rick shouting at me to run away. Apparently even the most docile bees (which ours aren’t to begin with) will get pissed with you rob them. Another lesson learned. Because of the holey jeans, I ran into the front yard, hands over knees, where Rick helped brush away any persistent bees. Then I changed my pants in the garage and decided that was enough honey to take for the day. I went back in whole jeans to close the hive back up and retrieve my bucket. So this first harvest was a small one. A few bees followed the bucket of honey everywhere until I hid it in the garage. Once the bees were finally off to other things, I took the bucket in the house. Once inside, I took the comb out of the bucket and put it into a bowl. Unlike traditional bee keeping, you can’t use an extractor to remove honey from comb built on a top bar. I used a kitchen knife to chop up the honey comb as much as possible so the honey could pour out. Then I put it all back in the mesh bag, back in the bucket. I left it in a warm place to drain for a couple of hours. The next morning (to give the bees time to simmer down from the robbery), I took the empty comb, bowl and bag outside to the bee hive for the bees to pick over and reclaim any left-over honey. They were all over that. Sort of a peace-offering, in my opinion. 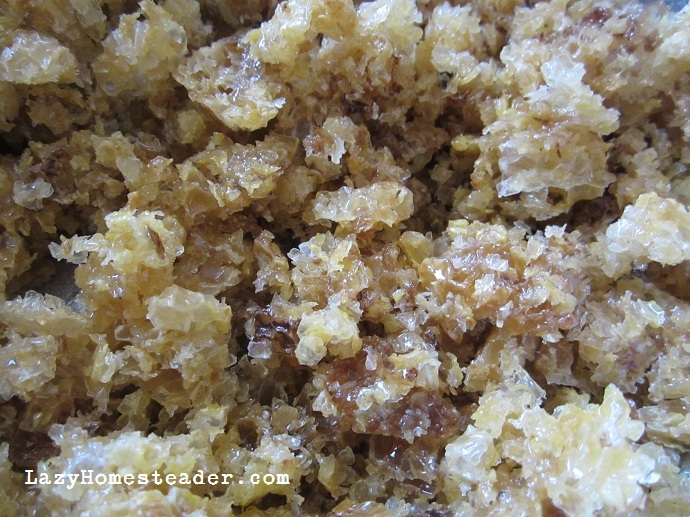 I left the empty beeswax overnight and retrieved it early in the morning before the bees were out. The bees had pretty much completely cleaned it. I rinsed the wax and plan to melt it into a candle or something crafty later. Finally, I put the honey into clean jars. I used half-pints, hoping to make gifts of a few. Each jar ended up holding about half a pound of honey. I ended up completely filling six jars, and nearly filling a seventh. 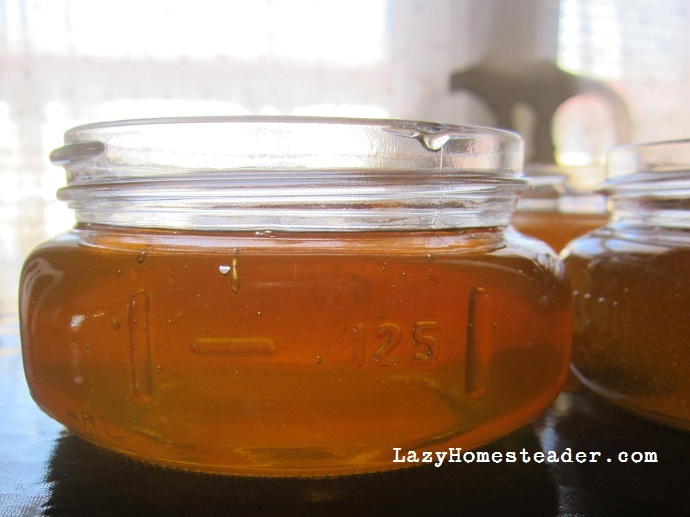 So, for two broken bars of comb, I harvested nearly 3.5 pounds of honey. Can I just say that I am really excited for the flow next spring? I’m anticipating a full harvest (and a do-over on the cross-comb thing). Oh – and the honey tastes delicious! I’m learning that there are no dumb questions when it comes to bees! Yes, the comb is made of beeswax. 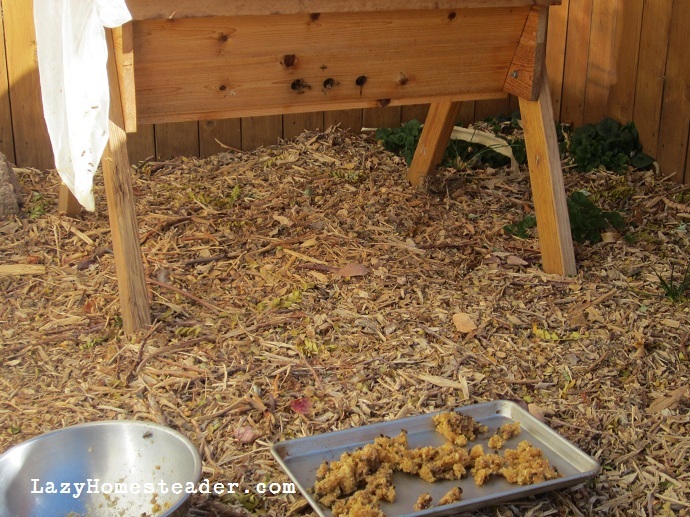 In a Langstroth hive, the wax is uncapped and the honey removed. The comb is kept intact otherwise and reused in the hive. Because of the nature of a top-bar hive, you can’t reuse the comb (wax) in the hive and get the honey out of it. So I’m hoping to use it myself! YUM! congrats on the first of many harvests! Don’t apologize for being a beginner! Even the most experienced beekeeper is a beginner because the bees are always teaching you something new. And you have certainly taught me something new, We haven’t gottent much honey from our bees, but this year they outdid themselves. Not enough to apply the old centrifugal force on them. Thanks for ‘learning’ me a technique even I could do without too much bother. Great post! Oh my! Sounds like us this year. We too are first year beekeepers using a topbar hive. We plan to take a bee class in the spring. Sort of after the fact. LOL Anyway, we had an awful time with the cross combing but seem to have it rectified. We haven’t checked to see how much honey they have for the winter, the timing hasn’t ever been right to get in there again this fall. Hopefully, it is enough. We didn’t harvest this fall because we were afraid they wouldn’t have enough. I have to get around to posting some pics on how my hubby fixed some of the cross bar comb. It worked great! Thanks Dawn. I’d love to hear and see your experiences with fixing cross comb! Please let me know when you post about it! Want to get even more honey out of that comb? 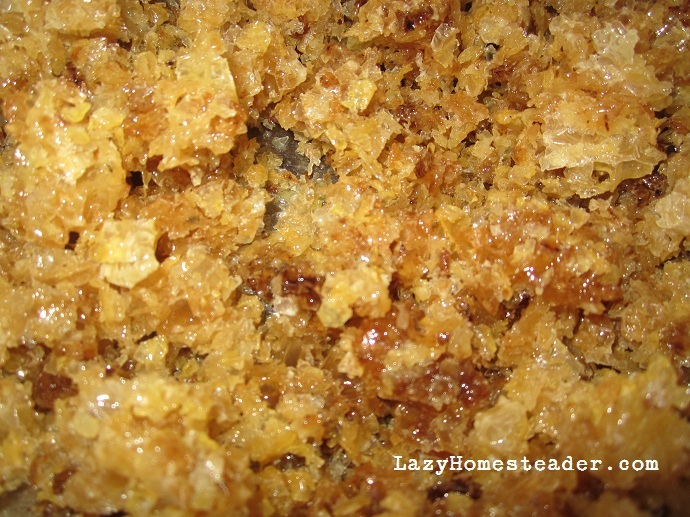 Put the comb in a glass bowl/jar and put in the oven on low until the comb is all melted. 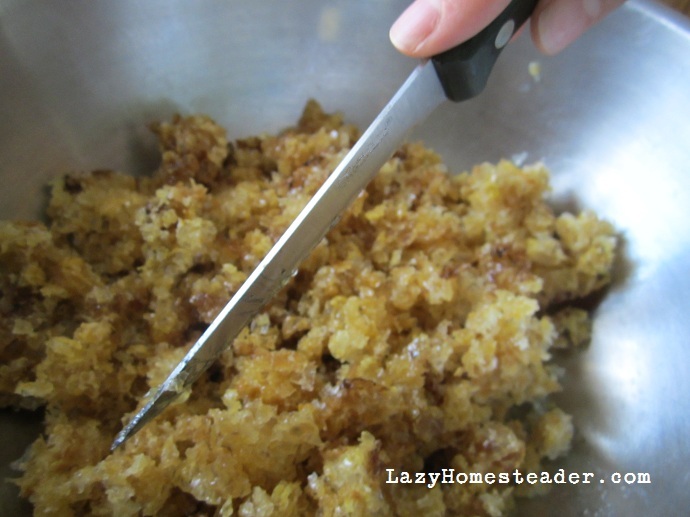 The melted wax floats to the top and the honey goes to the bottom. Let it cool so the wax solidifies and then pop it off. Viola! More honey. 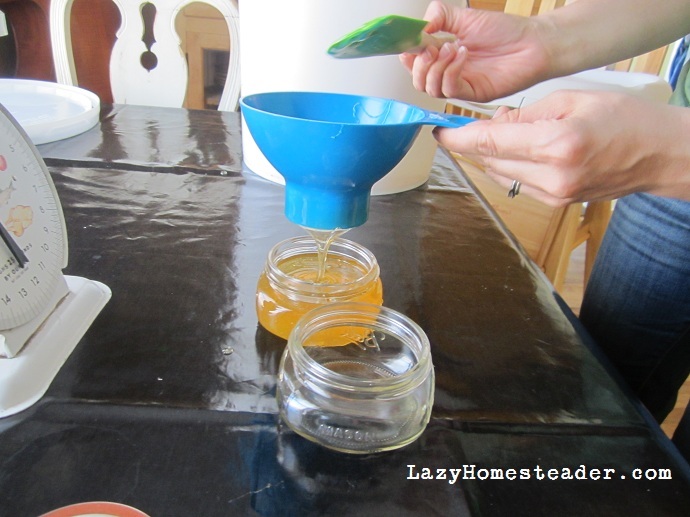 You’ll be surprised how much more honey you get too! Oh! Thanks for the tip Rachel! We will try that next time. Great idea, and sounds easy. And I like easy. I’m sorry you were stung; but lordy you were funny!!! That’s great! Thank you for sharing your experience with your first harvest. When you do a full harvest, how much do you leave for the bees? How do you know how much they will need? Thank you for the details & great photos. My husband is currently doing a ‘conventional’ beekeeping course, and I am doing a Warre ‘natural’ beekeeping course in a couple of weeks time. We are getting a warre hive at that time too (and being Spring here in Australia) hope to move a swarm into it. Very excited to finally be getting bees! 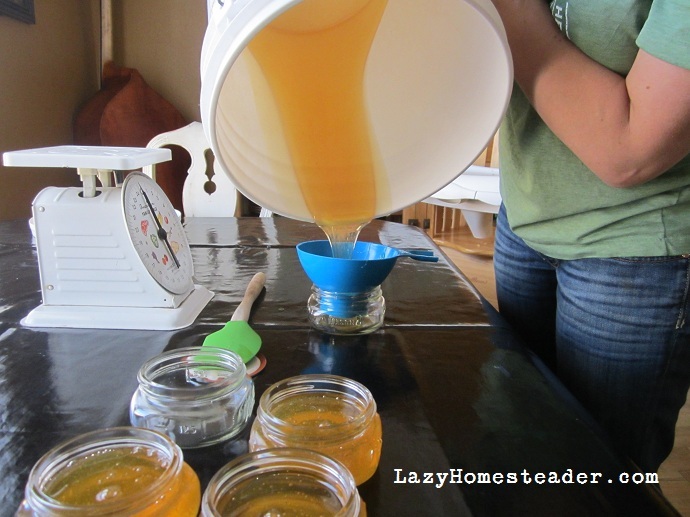 We use honey instead of refined sugar, plus the bees will be great workers in our backyard homestead! Our bees didn’t survive last winter, and we missed the bee package order, so we’re aiming for new bees this spring. How are your winters, and do you have to do anything special to help the bees survive? We harvest the honey a tiny bit differently- the way we do it makes it so you have a little bit less in the way of transferring honey to new containers (unless you want to put it in smaller jars). We also heated the leftover wax to get more honey out of it. We only have a couple of pints of honey left, so we’re going to have to buy honey to tide us over until we can get new bees. Would love to know where you found your blue (handheld) strainer? Do you happen to know the make/model, etc? Thanks! !